Immediate payment of US $1,382.80 is required. Having been collecting various gold coins, I had previously acquired a Canadian Maple Leaf that was in excellent shape, but about 10 years old. The 2015 Maple Leaf arrived in excellent shape, well packaged. a few days after I ordered it. I was surprised to see that the 2015 Maple Leaf has such an intricate background design - it radiates from the center to the edges. A brilliant gold color coin. It is perhaps the 'goldest' (not a word) coin I have. A real gem in my collection. The maple leaf defines the standard for 9999 bullion coins. 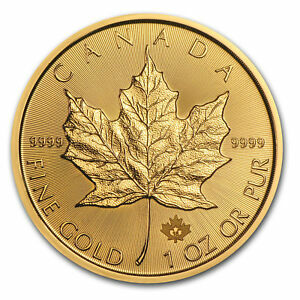 The Maple leaf is one the oldest "four nines" gold coins in the market meaning it comes with a 99.99% gold purity. The maple leaf gold coin was the very first gold coin I bought 20 years ago. Starting in 2007, the Royal Canadian Mint has introduced the "five nines" version of that coin which happens to be my favorite coin. However, the new 2015 Maple leaf with the added security features is in my opinion a very attractive design showing once again the technical leadership of the RCM. There is only one other coin on the market which could possibly rival the maple leaf and that is the Kangaroo coin issued by the Perth mint. Both coins share one common characteristics: They depict symbols of nature instead of political symbols. I happen to like that a lot. These two coins (the maple and the kangaroo) are the best buys on the market in terms of quality and low premium over spot. Thanks to the highly competitive bullion dealers on Ebay one can buy these coins occasionaly for much less than 3% over spot. My advice is: Watch the prices and keep your emotions calm! (There will always be good deals). The Gold Canadian Maple Leaf is a premier investment coin. The Canadian Gold Maple Leaf is .9999 pure gold. It is not as popular as the American bullion coins and that means the Maple Leaf can be had at a slight discount which makes it a good buy. 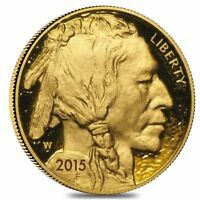 Gold bullion in coin form is harder to counterfeit than small gold bars and thus, more preferable. Our friends to the north have added an enhanced security measure on the reverse in the form of miniature maple leaf just under and to the right of the large maple leaf. These features make the Canadian Maple Leaf worthy of consideration for serious precious metal investors. If you have the liquid assets, diversify. Put some precious metals in your safe. It may go down in price, but will never go to zero. Buying through eBay has been trouble free and smooth. Just try to pre-arrange delivery when you know someone will be home to sign for it. 1 ounce 9999 gold from Canada is a great way to collect bullion. Buying precious metals is great insurance to fiat currencies.